First in a Sustainability series: Saint Mary-of-the-Woods College is proud to embrace sustainability as one of its values. How are we living it? 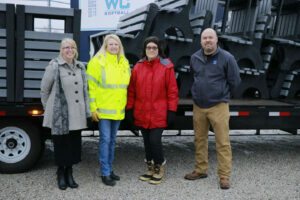 Vigo County Solid Waste Management District Executive Director Kathy Kinney (second from the left, in green) delivers 40 benches, picnic tables and trash receptacles to SMWC on Jan. 18. 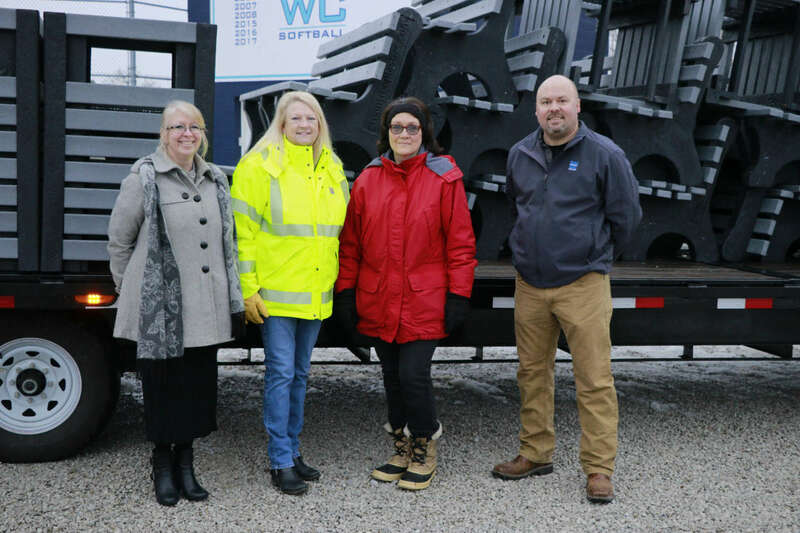 (from left to right) Director of Facilities Joshua Wood, Director of Grants Development Sue Dolle and Associate Director of Career Services Angella Gifford ’90 worked with Kinney on the project. The Saint Mary-of-the-Woods College campus has new, environment-friendly outdoor furnishings for students, employees and visitors to enjoy. 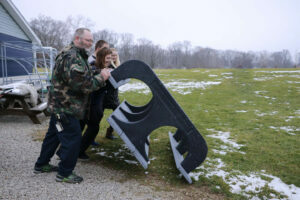 Benches, picnic tables and trash receptacles made of plastic caps collected by students from members of SMWC’s community and the Wabash Valley can now be found throughout campus with the delivery of 40 of these items on Jan. 18, the largest delivery to-date. The furnishings were placed in the athletic fields, the equine facilities, tennis courts and along The Avenue. Through the student-led Sustainability Club and the faculty/staff Greening The Woods Committee, SMWC has formed a partnership with the Vigo County Solid Waste Management District (VCSWMD) and its ABC Promise Program in the Caps to Benches project, an SMWC initiative recycling plastic bottle caps and lids into outdoor furnishing. The initiative started a couple of years ago with the intent of producing several benches for Le Fer Lake but the overwhelming plastic cap donations received from the community and the strengthening of this partnership allowed the project to evolve. With the agency’s help, 2,000 pounds of caps were taken to Green Tree Plastics in Evansville and for a cash match, were turned into recycled outdoor furnishings. The caps yielded four four-foot benches with matching dollars provided by members of SMWC’s Cabinet. The cash match for the remaining items — $15, 680 — was gifted by VCSWMD through the ABC Promise grant for 17 benches with backs, six picnic tables, nine trash receptacles and four team benches. VCSWMD Executive Director Kathy Kinney said the agency has been working with local schools and parks in an effort to raise awareness about recycling and to keep plastics out of the landfill. Plastic benches not only save plastic but also eliminate the need to cut down trees, she said. Plus, plastic benches are durable and will last longer than benches made out of wood. They also require no maintenance. SMWC students and staff put a picnic table weighing 475 lbs in place in SMWC’s athletic fields on Jan. 18. Kinney said she applauds SMWC’s commitment to sustainability and in teaching students about recycling. She enjoys working with Greening The Woods Committee members Susan Dolle and Angella Gifford ’90. The picnic tables, each weighing nearly 500 pounds, as well as the benches and trash receptacles, each at around 200 pounds, were transported through a long trailer and placed in designated spots with the help of volunteers from the Greening The Woods Committee, facilities staff and the athletics department. In a letter to Kinney, SMWC’s Vice President for Advancement and Strategic Initiatives Karen Dyer said these gifts from the agency makes the campus even more beautiful and welcoming. The placement of the recycled furniture were focused on visible and well-used areas. “We are grateful for your generous support of SMWC and the partnership to make this a more sustainable campus,” she wrote to Kinney. Picnic tables and benches were placed around Lake Le Fer last fall. SMWC will continue to collect plastic caps and lids for ongoing campus beautification effort. Led by Cross Country Coach Zach Whitkanack and the teams, SMWC donated caps to North Central High School, which is collecting to get three benches in memory of the three students killed in an accident over winter break.